We raised $1038 as a team. Our goal was $1000. 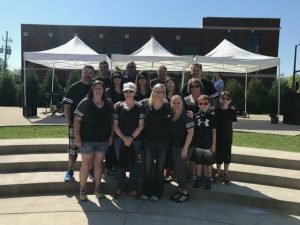 We walked two miles at this year’s JDRF (Juvenile Diabetes Research Foundation) Walk 2017. C4 Operations strongly believes in supporting our local community and worthy causes. The JDRF One Walk is an opportunity for both. C4 Operations isn’t just a background check company; it’s a company that believes in doing more, getting involved and making things better. C4 staffer’s personal testimony: As a type 1 diabetic (T1D), even when I am at my most disciplined and regulated with my diabetes management, I’m still playing a best guess game. There are so many things that can affect my blood sugar; it can be overwhelming. While there have been A LOT of advancements in diabetes management, no two diabetics are the same. We have the basic ground rules for management, but what works for one diabetic, may not work for another. We are all just trying to do the best we can with the information and products we have. And then there are those days that you have no clue why your blood sugar is doing what it’s doing so you feel frustrated and a bit defeated. Yes, we have a lot more information. Yes, we have a lot more technology advancements. Yes, we’ve drastically improved the quality of life for diabetics. But we don’t have a cure yet. We are still just using our best guess to manage a disease that requires a lot of us (mentally and physically) and takes more. That’s why I’m getting involved. I’m ecstatic that C4 Operations is backing me and the foundation. By clicking on this link you can help us raise money in the fight to find better ways to manage diabetes and ultimately, find a cure! .